Editor’s note: since the publication of this article, the oDesk and Elance marketplaces have combined forces into the new Upwork marketplace (a service provided by Upwork Global Inc.). For more information about this transition and what it means for aspiring freelancers, click here. Want the freedom to set your own work schedule, choose your clients, and work from the comfort of your own home? Freelancers around the world are making this dream a reality, thanks to oDesk.com marketplace (the world’s largest online workplace). With over 4.5 million registered freelancers and some 1.5 million jobs posted annually, oDesk has become the go-to source for businesses looking to recruit top talent both in the U.S. and abroad. 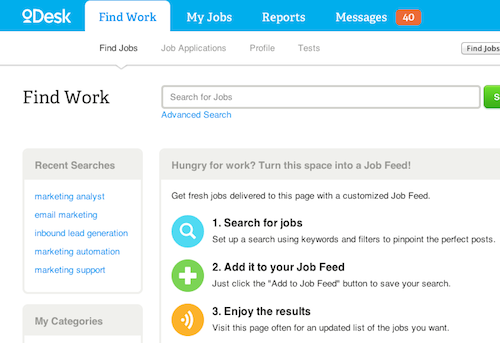 Whether you’re unemployed, underemployed, or just looking for a change – your dream job could be just a click away. In a nutshell, oDesk is an innovative platform that connects employers with virtual freelancers. Aside from the cost-saving benefits of hiring hourly employees, businesses also appreciate the opportunity oDesk presents to reach talent from around the world. Geographical location is no longer a barrier. In addition, the oDesk time tracking tool makes it easy for freelancers to get paid for the work they complete. Simply log in, work, and get paid – it really is that easy. oDesk is a win-win for both employers and freelancers alike. Is oDesk a Legitimate Company? oDesk recently reached a huge milestone in the online freelance movement. As of August 2013, over $1 billion (U.S.) had been spent on work conducted via oDesk. The company has also been recognized as one of the fastest-growing companies in the United States for four consecutive years and has been awarded multiple distinctions for its online workplace. To answer the question at hand; yes, oDesk is a legitimate company where freelancers can find legitimate work. Is It Free to join oDesk? Yes, oDesk is absolutely free to join. Getting started on oDesk is a three step process: build your profile, get to work, and earn a living. Editor’s Note: As noted above, since the original publication of this article, oDesk has merged into a new company now known as Upwork Global, Inc. The Upwork marketplace is still free for both businesses and freelancers to join. If you’re interested in signing up for a free Upwork account, click here to learn more if it’s right for you. You might also find my personal journey helpful. Click here to read my top-rated book about freelancing online.